By the way, you can transfer to Limited Express Yakumo (やくも) to Okayama (岡山) at Yonago. 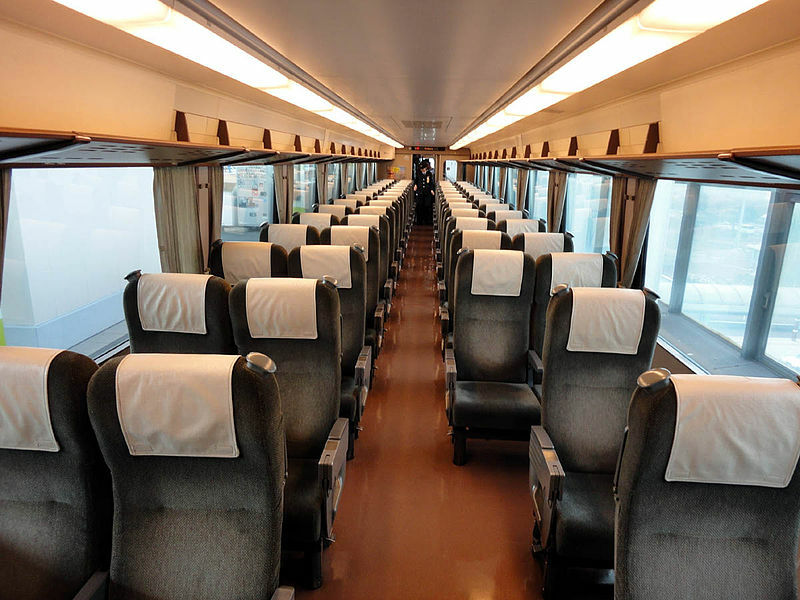 The primary trains from Tottori to Okayama is Limited Express Super Inaba (スーパーいなば). But this train goes through non JR railway, Chizu Kyuko Railway. You have to pay extra if you use this train from Tottori. If you take Super Matsukaze and Yakumo, you can avoid to pay extra to Okayama from Tottori on Japan Rail Pass. But travel time is 1.5 hours longer than Super Inaba. Please check the details about Tottori – Okayama transfer at the post, The fastest train access to Tottori from Okayama. Limited Express Super Inaba. I will show you this train’s route, schedule and accommodations. There are seven round trips altogether. Other limited express Super Oki is operated on same section too. There are another 7 round trips. Please check the post, Access to Tsuwano, Izumo, Matsue from Yamaguchi. Limited Express Super Oki too. Super Matsukaze is operated by KIHA 187 series. There is only ordinary class. No Green seat is available on this train. The seat configuration is 2+2 and the seat pitch is 970 mm. There is no difference between non reserved seat and reserved seat. On board sales is not available. Please prepare drink or food if you want before boarding. All trains are operated by two cars formation except Super Matsukaze #2 from Yonago to Tottori. Smoking is not allowed on this train. I will be visiting the San-in area and will be headed there after I visit Iwakuni. However, I have 2 options for routes to get there. I can either go from Shin-Iwakuni to Shin-yamaguchi and take Super Oki to Yonago, or I can go to okayama and take Super Yakumo. Both routes depart Shin-Iwakuni around 11-12pm. Super Oki route will arrive before 5pm, Super Yakumo route arrive a little after 3pm. Is the scenery worth the extra long ride on the Super Oki route? The only plans i have once i get to Yonago is to take a train to Sakai Minato and go see the Eshima Ohashi Bridge and have dinner. What are your thoughts? Super Oki route is extremely more recommended. Especially Super Oki runs along the coastline between Masuda and Izumoshi. This segment is very very nice. If i take Limited Express Super Matsukaze from Matsue to Tottori, do I need to pay extra charge? or the journey will be fully cover by JR pass? It’s fully covered by JR pass. Please advise is there any rail pass available to my trip. There is no deals available unfortunately. Regular ticket is your choice. Can I use the San’in-Okayama Area Pass on the limited express super matsukaze, from yonago to tottori? For Sanyo-San’in Area pass, from Tottori to Yonago, can I use limited express super oki? Can I use the Sanyo-San’in Area pass from Yonago to Tottori using the limited express super matsukaze?